When Cincinnati’s finest homes make it onto the real estate market—its Queen Anne mansions, Tudor and Greek Revival landmarks and Victorian gingerbread homes—chances are the listing agent is Perrin March. Throughout a 20-year-career in residential real estate, Perrin has listed and sold some of the Queen City’s most recognizable, beloved and remarkable properties. Every home has a story to tell. “I don’t sell houses…I sell homes." For Perrin, the selling process begins with extensive research into a home’s history, its architectural style and construction details, as well as the families who have lived there. Perrin expertly weaves the home’s story into its listing. Through his well established relationships with media, the story is retold in the region’s most widely read publications and becomes part of Cincinnati’s cultural fabric. The art of selling. Perrin raises selling to an art form—his artistry a unique combination of astute business sense and creative flair. His selling style can be traced to two early influences in his life. His father, Perrin March III, ran the family’s machine tool business for 70 years, earning a reputation for uncompromising integrity, business acumen and work ethic. His mother, Maud Rydin March, is an acclaimed artist whose large, evocative tapestries have been exhibited at leading museums. 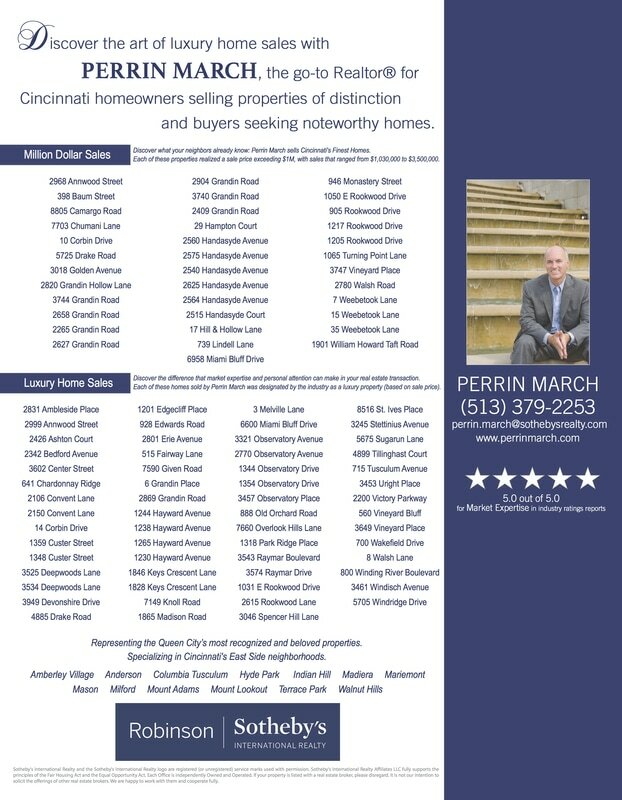 A native Cincinnatian with insider’s knowledge of the region and its homes, Perrin offers clients unparalleled marketplace expertise, along with experience, competence and confidence developed over two decades of selling the area’s finest homes. Luxury home specialist. Perrin's commitment to selling the right home to the right buyer at the right price has secured his longstanding reputation for excellence within the luxury home market, his area of expertise. Specialty services include home staging, professional photography, and high-end marketing across an array of platforms—from web-based and social media to print publications and elegantly designed collateral materials that showcase each home’s unique characteristics. As a negotiator and closer, Perrin is renowned, earning repeat business, referrals, and industry recognition. Winning philosophy. Perrin excels in patience. He believes in honesty, trust, being genuine and taking the time to ensure his clients’ happiness. These traits, along with his marketplace expertise, have earned him repeat business and referrals—and are the reason discerning homeowners throughout Greater Cincinnati seek him out to tell their homes’ stories. Among the region’s top-selling luxury home specialists, Perrin & Diane March are Greater Cincinnati's go-to Realtors® for homeowners selling properties of distinction and buyers seeking noteworthy homes. A house is a space to occupy, a home is a place to live. Between 1986 and 2010, we were known as Robinson Realtors and our mission from the very beginning was to provide the highest level of expertise possible to every client that passed through our doors. We have sought to become the most informed professionals in our region and to promote the interest of our clients with consummate thoroughness. This includes paying special attention to quality photography, compelling brochures, and individually tailored, comprehensive marketing campaigns. We joined Sotheby's International Realty in the fourth quarter of 2010 because this partnership greatly enhances the marketing power and reach in the service of our clients. Each of our agents/associates now has a phenomenal range of sophisticated marketing tools at their disposal.